Now that it is 2015 - are you ready to kick off the New Year and take your career to the next level? 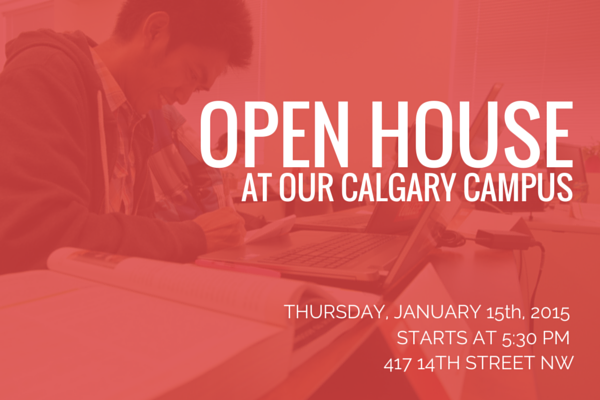 If you have been considering going back to school or upgrading your career in 2015 - why not start the year in the right direction by attending our Open House at our Calgary campus, taking place Thursday, Jan 15th, 2015? Education is quite a significant purchase and is definitely an investment you make for your future. We understand that there are lots to consider before you commit, so we want to make the process as transparent and simple as possible for all of our students. At the Open House, you will have the opportunity to meet with members of our Career Services and Financial Aid teams. They will be able to answer any questions you have regarding our programs, financial aid options, learning outcomes, career paths and employment opportunities after you graduate in a year's time or shorter. At Robertson College, we make sure all of our students receive the support and assistance they require, every step of the way. Whether they are in the registration process and need help selecting the right career path, during their program or after graduation, when it is time to look for a job, our staff will be there to offer assistance. If you are interested in attending or have questions about the event, please contact calgaryevents@robertsoncollege.com for more information. We hope to see you there!